Bathroom Remodel – New Towelbars & Accesories | Alcher Interiors, Inc. 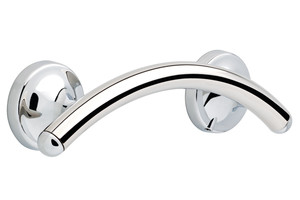 Grab bars by Delta can be placed to not only provide safety but still add a decorative touch. 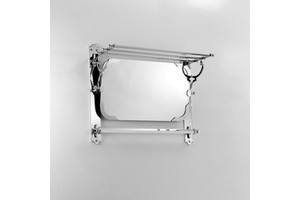 Devon and Devon is introducing an innovative way to save space with a wall-mounted towel holder that has a tilting mirror. Atlas has introduced Bamboo Hardware made by hand everything from knobs to towel rings. They are available in brushed nickel or aged bronze. 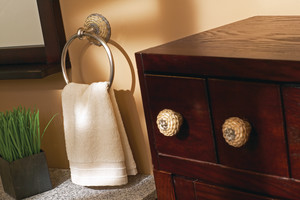 Typically bathrooms have limited space so as you consider redoing the bath, try to select multifunctional accessories. Contemporary designs with their clean lines are gaining favor. We are happy to help with your selections as Alcher Interiors’ guides the new look for your dream bathroom.